In ‘All Rise’, Zac and Paul return to London with Angus. It begins the process, sometimes painful, of the unraveling of everything that happened since Paul was abducted in New York. Some of the threads reach back years into the past. Zac has some awkward confessions to make. A trip to Brighton leads to a gift for Paul and Zac and we ain’t talking a stick of rock! When the weekend is over, Angus finds that he has a visitor; and another chapter opens … in Skull and Crossbones, case file one of series two. 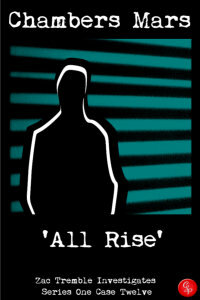 ‘All Rise’ is the 12th Zac Tremble Case File in the series Zac Tremble Investigates; the case files of the gay, Soho-based PI Zachary Tremble. ‘All Rise’ is the series one finale. It follows on from, in order: Chrysalis, Metamorphosis, Transmutation, The Red Kimono, The Ephemeris Protocol, Delphes, Slip Knot, Hide and Seek, Some Like it Strange, Hemp Rope and Men at Arms. There are twelve case files in series 1. And if you can’t wait for the first twelve cases to appear individually, then Jury’s Out is also available – Jury’s Out is the complete first series.